I just restored the image links for the old entries that originally were posted with iBlog. 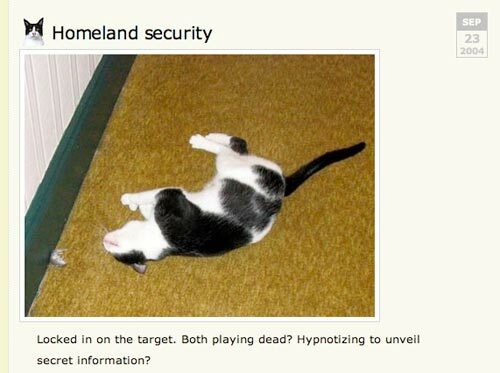 After exporting the iBlog entries using Agitprop and importing them in a local WordPress install using MAMP (or WAMP) – Bruce Mc Kenzie has a very good write up on this process on his blog – the image links pointed to localhost. This meant they showed fine on the local computer. There has to be an easier way to fix this outside of opening iBlog and a 3rd party offline Wordpress client (can’t be done online, as images need to be uploaded) simultaneously; and copy/pasting entry data between the two. Each problem actually has an easy fix and can be done online or offline in your MAMP/WAMP environment. 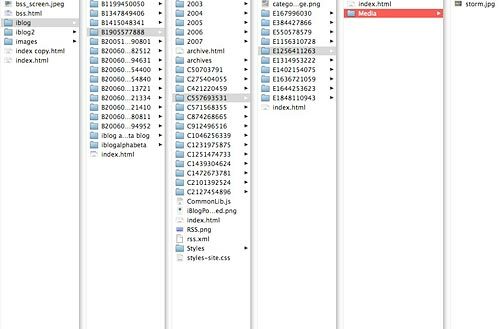 iBlog has the following folder structure. Images are buried several levels deep. 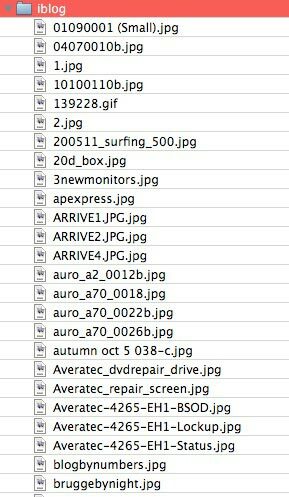 Which would give you a serious workout if you were to manually retrieve those images. Using FileJuicer (MacUpdate, Homepage) you can extract all the images in one step. In the Preferences, select the images file types you wish to extract (generally GIF and JPG) and in the results designate a destination folder. Deselect thumbnails as those are not needed. Drag and drop your Sites > iBlog > Bxxxxxxxxx folder over to the FileJuicer window and it will do all the heavy lifting for you. In the result folder there will likely be some category icons and maybe some other files you know you will not need on the new blog. So delete those. Time to upload the rest of the extracted files to your Wordpress blog. You may know that Wordpress stores images in dated year and month folders, which would pose a problem. 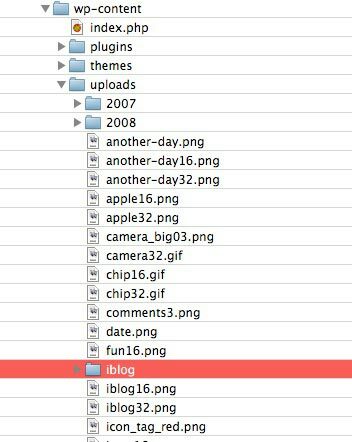 But, the old iBlog entries we imported have an image path without dates; so we can just simply upload all iBlog extracted images to one folder. To keep things neat and tidy I decided on a subfolder /iblog under uploads. Using FTP I created iblog under uploads. And copied all extracted images over. Manually this would be another one of those repetitive nightmare things. Download the plugin, copy it to the Wordpress plugin directory on your server and activate it in your Wordpress environment. Safety note: There is no undo with this plugin. So, make sure you have a backup of your Wordpress installation and database and familiarize yourself with how you may have to restore it in case things don’t go as planned. The fact that this Search and Replace function worked fine for me doesn’t guarantee it does for everybody or that one can’t make a mistake in using it. We know we uploaded the images to uploads > iblog in my case and so we can do the following replacement using the Search and Replace plugin. Select the top option to search and replace inside Content. And set the path to reflect that of your iblog images on your server installation. DNS vacuum – no email for me? Or maybe I should say DNS hell? If you have tried to email me in the past week, you will have received a 550 Relay Prohibited automated reply. Which is unfortunately not fixed yet. 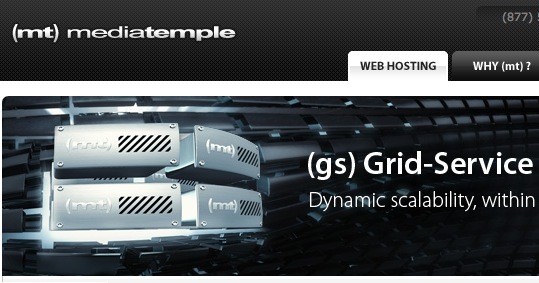 This 1and1 domain now points correctly to mediatemple (not .mac or wordpress.com), but it also ate my email settings. 1and1 Support said that shouldn’t have happened and has given me instructions on how to solve it. Basically you revert Basic DNS Settings back to 1and1 and then switch back to My Name Server, add mediatemple again as your own name server, save, wait for updating. 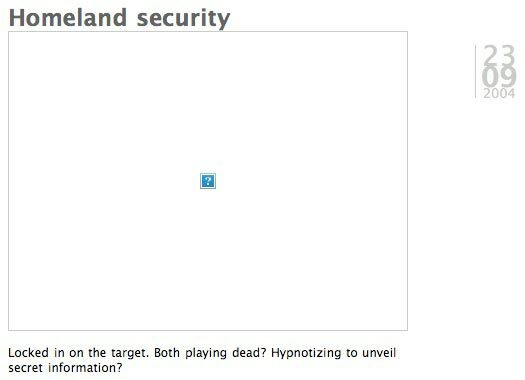 You see the web domain go down … and back up. And, you still don’t get email. Wonderful. A second call. Followed the instructions on the phone. Wait. Still no email. To me it seems there is an issue with their setup where Basic and Advanced DNS don’t mix. With the Default Basic DNS you get access to the MX mail server. Strangely enough once you point to your own DNS server – as per their instructions on how to do it – the MX server disappears from Advanced DNS. I think their support suggestion of applying settings under both Basic DNS settings doesn’t work. To me it seems like a clear selection from a pull down menu for a reason. Which ever you have selected in Basic is what is retained when you hit Save. I sometimes really cannot understand how something so simple can be so hard with large companies. I can’t be the only one, let alone the first one, having this problem. Can I? I’m also trying to get some input from MediaTemple (mt). I have recreated my mailbox there, but neither the old mailbox at 1and1 nor new one at (mt) is getting any mail. Hopefully things will be back to normal shortly. Nothing is more frustrating than trying to fix something you don’t have control over. Now, why didn’t any of the smart people at 1and1 tell me that after changing the DNS setting, the record is actually controlled by (mt)? Rooting around (mt) moments ago I just found I could edit my own zone file which contained my new MX server setting. And, (mt) just informed me I had created my email account correctly, but not activated it in another screen. Eh? All right. My bad then. Chances are this is your first visit to my new online home. Welcome. I had the server space for a while already, looked a little bit closer at wordpress.org but kept waiting for either a) me to manually fix the old iBlog entries that didn’t carry over well into wordpress.com or b) the new export function from iBlog 2. I don’t really want to do the manual thing, the iBlog export function is not here yet and at the same time I want to get a little bit of a custom blog up again. The old stuff isn’t that important right now and I can fix it later when I have more time. So, here it is and here you are. New blog meet visitors. Visitors meet new blog. No, the new blog is not finished yet. I still need to bolt a few things onto the chassis. I already had to make some changes to my original theme idea. That’s how things go, you think something will look right and then you say … eh, no! And, since right now the blog is running on a modified third party theme; I am sure there are still some cobwebs around. In fact I have only edited a handful of the dozen or so files … so who knows what you see on some pages. But, it is a start and a new beginning. The landing page looks OK and the rest will come gradually. We’ll get some extras installed. The gallery should be next shortly, in a few weeks, I hope. Time to throw some images from the past few years at it, redo the whole gallery while I am at it and rescan some of the originals (that is going to take a considerable amount of time). Since so many friends and family members now have broadband too, the time is probably right to start serving bigger and heavier images instead of tiny ones which were tweaked for dial-up. Anyway. The gridserver blog is up and http://blog.icerabbit.com is forwarding here. Update: Forwarding will be sorted out later. I ran into a little path loop between 1and1 and mt; so for the time being the blog subdomain is inactive. I have just imported most of the old iBlog library into WordPress. In the next couple hours & days I will be making some corrections like adding missing images back. The conversion process also left many entries with improper line breaks and read more links where they are not needed. And, there’s only several hundred of them. Update: I am still adding images back to the older entries. I’m doing them a few at a time. on the left – LOL) are being published.